Second template of the month is Your News. With simple layout and plenty of space for your news and visitors information, this template is must have news portal with plenty of news items to start with. Demo is enhanced with 4 new Joomla extensions. You Weather, Your News Slider, YJ News Slider 10, YJ Newsflash 7.0, enhanced version of our free YJ Title Ticker module, and specifically made CSS override of our YJ NS 8.0 module. With this joomla template you are ready to serve fresh news to your visitors. This template is compatible with Joomla 1.5 Joomla 1.6 Joomla 1.7 and Joomla 2.5. 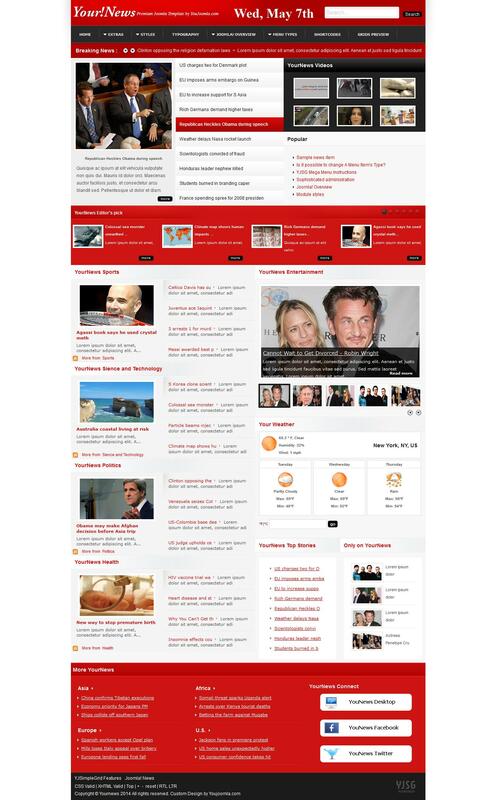 Beautiful Joomla template to create a news portal. Magnificent news template for CMS Joomla! from the studio YouJoomla - YJ YouNews. For template specially created styles popular models You Weather, You News Slider, YJ News Slider 10 and YJ Newsflash 7.0. Was also created a completely new module YJ NS 8.0 module.